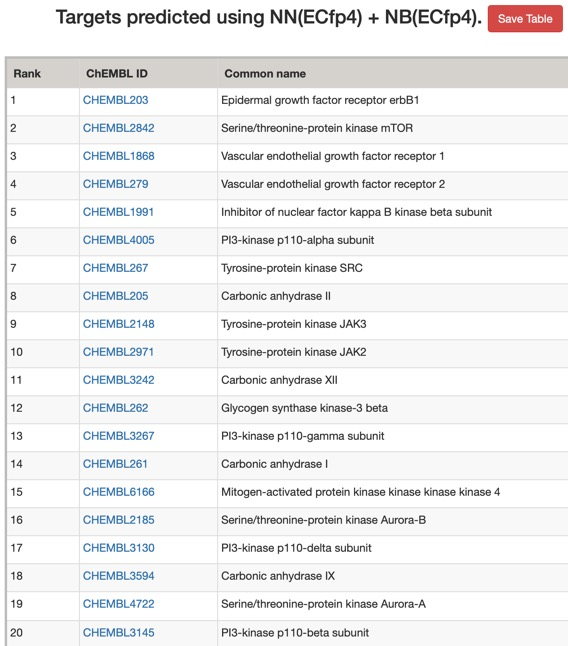 PPB2 was built from bioactivity dataset of all compounds having at least IC50 < 10 uM on a single protein target in ChEMBL22, considering only high confidence data points as annotated in ChEMBL and only targets for which at least 10 compounds were documented. This provided 344,163 single compounds associated with 1,720 single protein targets belonging to 8 different target families, representing 555,346 target-compound associations. To encode molecular structures we selected three fingerprints perceiving different levels of details, namely: 1) MQN(Molecular Quantum Number), a 42-bit scalar fingerprint representing molecular composition by atoms, bonds, polar groups and topological features36, 37particularly useful to search and visualize large databases;38-402)Xfp (atom category extended atom-pair fingerprint), an 55-bit scalar fingerprint perceiving molecular shape and pharmacophores and well suited for scaffold-hopping virtual screening;41and 3)ECfp4(extended connectivity fingerprint up to four bonds), a 1024-bit binary substructure fingerprint encoding detailed information about molecular structure. 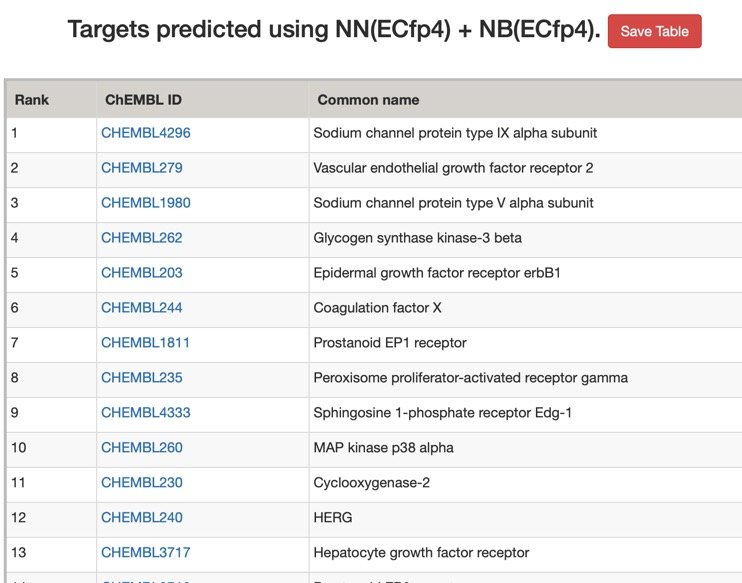 Starts with a carefully selected subset of ChEMBL 24 data containing pairs of compounds and single-protein targets. They used two activity cut-offs, namely 1uM and a more relaxed 10uM, which correspond to two models trained on bioactivity data against 1028 and 1569 targets respectively. Morgan fingerprints (radius=2) were calculated using RDKit and then used to train a multinomial Naive Bayesian multi-category scikit-learn model. 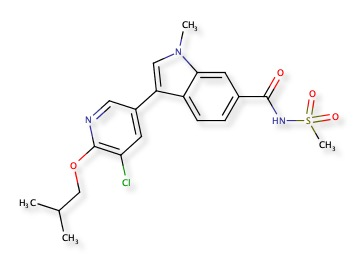 These models then were used to predict targets for the small molecule drugs. The Jupyter notebook is available for download. Protein target prediction using Random Forests (RFs) trained on bioactivity data from PubChem (extracted 07/06/18) and ChEMBL (version 24), using the RDKit (2048bit Rdkit Extended Connectivity FingerPrints (ECFP)) and Scikit-learn, which employ a modification of the reliability-density neighbourhood Applicability Domain (AD) analysis by Aniceto DOI. This project is the successor to PIDGIN version 1 DOI and PIDGIN version 2 DOI. 10,446 models generated at four different cut-off’s: 100μM, 10μM, 1μM and 0.1μM for 7,075 biological targets. Bioactivity threshold (can use multiple split by ','. I used—ncores=8, and I compared the default Applicability Domain —ad=90 (most stringent) with —ad=0 (no filter). PIDGINv3 applies the reliability-density neighbourhood Applicability Domain (AD) analysis by Aniceto et al., from: DOI. Comparing the models is actually non-trivial, it would be interesting to have a molecule with known target and off-target activities, however such molecules are likely to be in ChEMBL. Using recently published molecules means they won't be in ChEMBL but unfortunately little off target info is likely to be published. I decided to use a selection molecules. 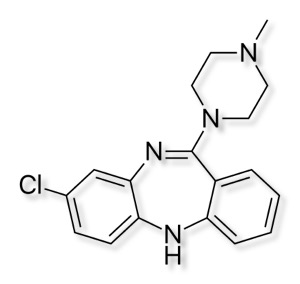 Clozapine is a well established neuroleptic drug, in a 2013 study DOI in a comparison of 15 antipsychotic drugs in effectiveness in treating schizophrenic symptoms, clozapine was ranked first and demonstrated very high effectiveness. Despite the widespread use the mode of action is still a little unclear and it has been shown to interact with a wide variety of receptors, ion channels and enzymes shown in the table below. Values are Ki (nM). The smaller the value, the more strongly the drug binds to the site. All data are for human cloned proteins, except σ1 (guinea pig), MOR (rat), DOR (mouse), and KOR (guinea pig). The predictions using PPB2 are shown in the image below. 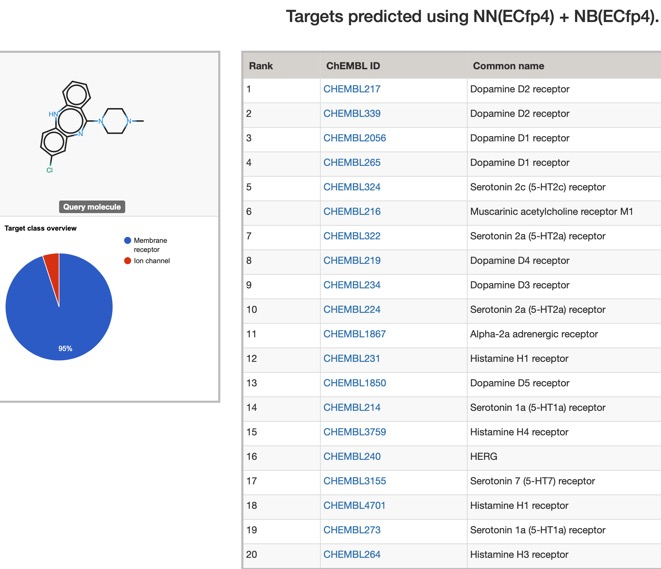 The predictions using the ChEMBL 10 uM model are shown below (only human displayed). For such a promiscuous molecule the results from PPB2 and the ChEMBl models it is not surprising that both show broadly similar profiles with multiple bioactivities, with multiple GPCRs being flagged, PPB2 also flags the HERG ion channel and Clozapine is reported to have an affinity of 320 nM DOI. The default AD=90 flag of PIDGINv3 is quite stringent in assigning predictions in order to reduce the false positive rate, the AD=0 effectively turns this off. I suspect users will need to experiment a little with this parameter to get a feel for the most appropriate level. This annotates any known actives as shown below, it also flags any known inactives. For a compound like Clozapine this seems to be a useful since it lets you focus on potential bioactivities that have not been measured experimentally. As more data becomes available I can see this being useful, particularly for evaluating molecules from high-throughput screening. 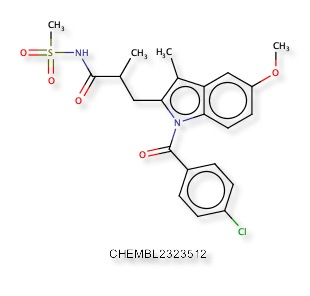 For a known promiscuous molecule like Clozapine all models correctly flag multiple activities for which known experimental data is available, perhaps unsurprisingly they also flag other activities for which there is no data in ChEMBL, the —known_flag in PIDGIN is very useful in this instance. 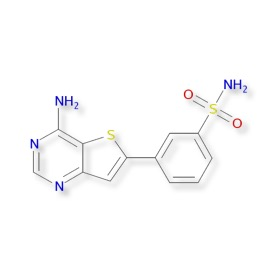 A recent publication "Discovery of Indole- and Indazole-acylsulfonamides as Potent and Selective NaV1.7 Inhibitors for the Treatment of Pain" DOI describes 3-Aryl-indole and 3-aryl-indazole derivatives were identified as potent and selective Nav1.7 inhibitors. The reported activity is potent hNaV1.7 inhibition (IC50 = 108 nM) and good selectivity (hNaV1.5 IC50 =19 μM). Nav1.7 is a voltage-gated sodium channel and is also known as sodium voltage-gated channel alpha subunit IX, NaV1.5 is also known as sodium voltage-gated channel alpha subunit V. A structure search confirmed the molecule below was not yet in ChEMBL, and a similarity search within ChEMBL identified CHEMBL2323512 as the most similar compound (81%), this is reported to be an Aldo-keto reductase family 1 member C3 inhibitor DOI. All models flag the sodium channel as a potential target, and also highlight kinases as potential off-target activities. OSM-S-106 is a screening hit from the Open Source Malaria project since this hit was identified using a phenotypic screen the mode of action is unknown, several exciting studies are underway to try and identify the mechanism but I thought it might be interesting to use these tools to try and predict potential biological targets. One issue in this sort of study is that the underlying data is heavily biased towards human targets. Never the less it might point towards targets that might be investigated in the malaria parasite, in addition knowledge of potential human off-target actives is also extremely useful since the eventual drug will be dosed to humans. OSM-S-106 is actually in ChEMBL, CHEMBL581088 has very limited data in ChEMBL, mainly high-throughput screening information, and does not appear to have been cross-screened. 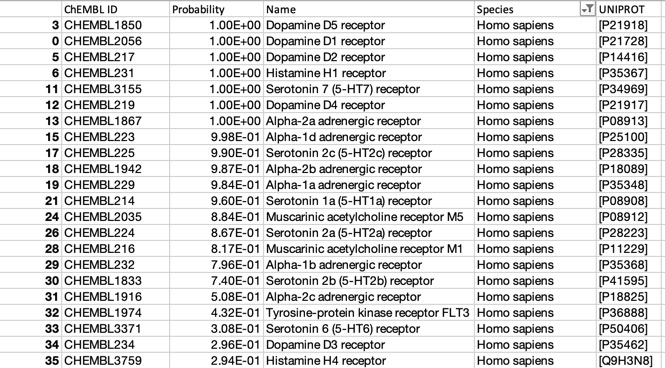 The predictions using the ChEMBL 10 uM model are shown below (all species displayed). 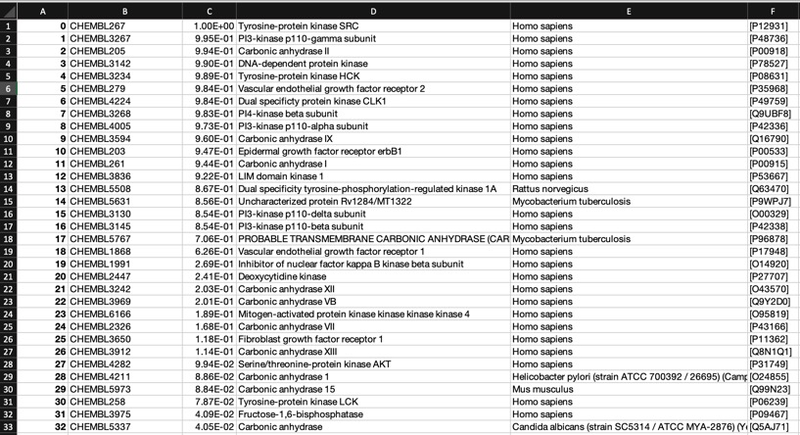 Looking at all the models it is clear that a variety of kinase targets are flagged together with Carbonic anhydrase. A quick literature search confirms that Malaria parasite carbonic anhydrase inhibition is a known mechanism of action DOI, and kinase inhibition DOI has been proposed as a therapeutic approach for the treatment of Malaria.